Bluebox worked in corporation with TAG/TRAUM to install the Optoma projectors to create the stunning Roncalli circus holographic experience. “We have been using Optoma projectors for 6 years and have consistently had a very positive experience in price, performance and reliability. We needed a high contrast projector with great colours for the 3D effect and the ZU850’s 2,000,000:1 contrast is perfect for this project." "I thought the hologramm at the beginning was really great. You actually remember the circus, especially Roncalli, with horses and dogs, they always used to be part of it, and I think they really included it well. Also in the beginning when they told the story in a new kind of way." "I find the hologramm very contemporary – especially the fact that there are no animals involved is very good." Challenge: The Roncalli circus, founded in Germany in 1976 wanted to develop the traditional circus experience in an imaginative, creative way. Solution: Roncalli’s agency TAG/TRAUM in cooperation with Bluebox selected Optoma as the best solution for this project and installed 11 ZU850 laser projectors for a mesmerising holographic experience. 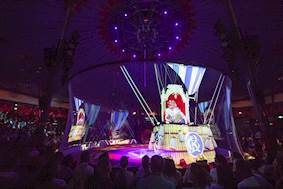 Results: Optoma’s ZU850 projectors bring the Roncalli circus to life, thrilling audiences all over Germany and Austria with entertaining holographic footage. The Roncalli circus, founded in Germany in 1976 wanted to develop the traditional circus experience in an imaginative, creative way. 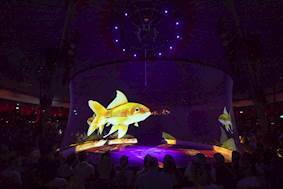 Roncalli wanted to create 3D holographic images from bright, reliable, long-lasting projectors to fill the circus arena measuring 32 metres wide and 5 metres deep with 360° visibility for the entire audience. Roncalli’s agency TAG/TRAUM in cooperation with Bluebox selected Optoma as the best solution for this project and installed 11 ZU850 laser projectors for a mesmerising holographic experience. Birger Wunderlich at Bluebox stated: “We have been using Optoma projectors for 6 years and have consistently had a very positive experience in price, performance and reliability. We needed a high contrast projector with great colours for the 3D effect and the ZU850’s 2,000,000:1 contrast is perfect for this project." Boasting superior colour performance and 360° projection capability, Optoma’s ZU850 model with innovative MultiColor laser technology has assisted in creating a phenomenal experience for Roncalli circus visitors. Thousands of visitors now enjoy a modern, entertaining twist on the circus experience. With 360° projection of horses galloping around the arena and elephants doing head stands, the Roncalli circus experience is not one to miss. The installation was completed using 11 BX-CTA03 long throw lenses allowing the ZU850 projectors to be positioned further away for ultimate flexibility. 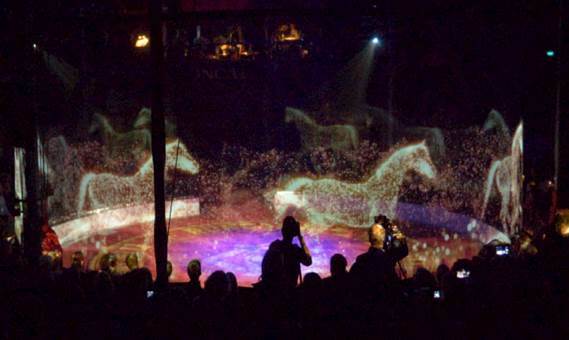 Optoma’s ZU850 projectors bring the Roncalli circus to life, thrilling audiences all over Germany and Austria with entertaining holographic footage. Janine Kunze, an actress from Germany stated: "I thought the hologramm at the beginning was really great. You actually remember the circus, especially Roncalli, with horses and dogs, they always used to be part of it, and I think they really included it well. Also, in the beginning when they told the story in a new kind of way." 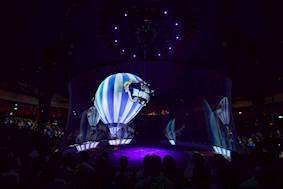 Visitors of the Roncalli circus are left mesmerised and inspired by the effects produced by the Optoma projectors. 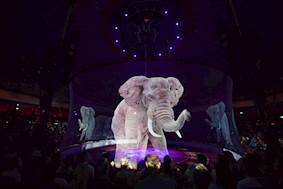 Katja Burkard, a TV Presenter from Germany stated: "I find the hologramm very contemporary – especially the fact that there are no animals involved is very good."